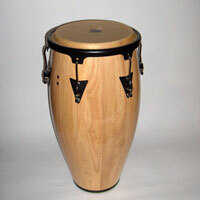 The congas are an adaptation of hand drums (played with the fingers) with cylindrical shape (with shell in hollowed tree trunk) coming from Congo (named "Ngoma" in Bantu). These are the rebellious slaves exiled from Africa to Cuba who invented by converting French wine barrels, by mounting skins on them. The technique of drum shell with solid oak slats bent in the heat of fire and with iron-bound, is remained, but the African tension system with rope or nails was improved, by using a steel hoop and tension rods (invented by the Cuban Gonzalo Vergara in the 1950's). To expand the range of tones, very elongated barrels were also created (thereby closer to their African "parents"). The skin is still a cowhide but oiled to make it waterproof and therefore insensitive to changes in humidity of the air, which affect the tension of the skin. 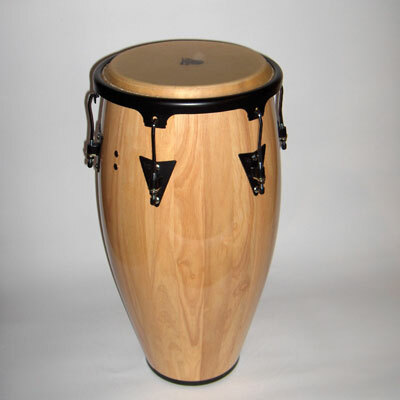 Today congas slats are usually carved to give the rounded shape and then glued, sanded and lacquered. Cheap versions with plastic shell also exist but their sound is pretty poor and ugly. The steel parts can be painted (cheaper but it doesn't affect the sound very much), chromed (strongest) or even gold plated (luxury models, for the scene). 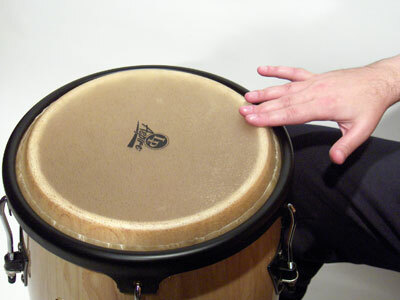 The "tumba" means a low and large conga (about 12 inches diameter hoop (1 inch = 2, 54 cm)). 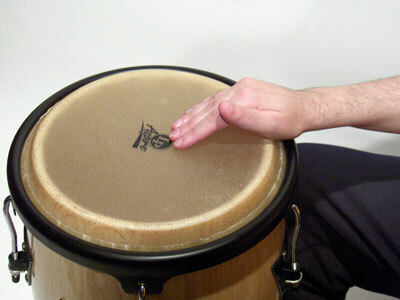 The "conga" means a medium drum (about 11 inches in diameter skin), the "quinto", a high pitched drum (about 10 inches). 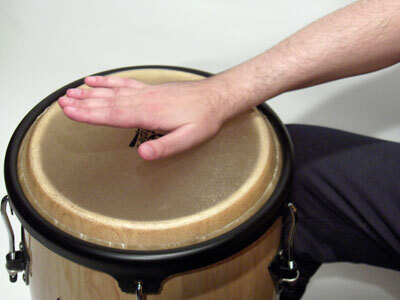 Traditionally played in pairs, as in Africa, many contemporary virtuosos play on 4 or 5 congas (like Giovanni Hidalgo , Ray Barretto , Raul Rekow , Miguel "Anga" Diaz , to name a few (see my lesson: "The playing with 4 or 5 congas")). 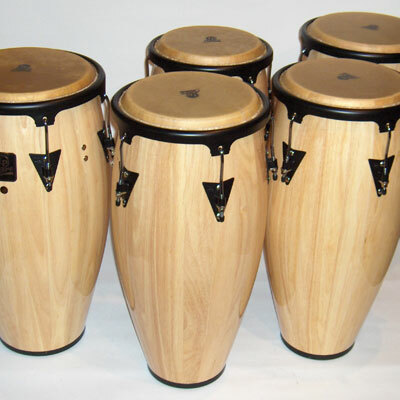 The congas can be played sitting or standing with special stands that elevate them. 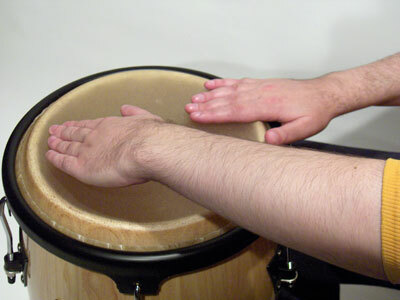 At least one conga (usually the higher pitched) is always placed between the legs, when playing seated. It can be very slightly forward tilted, leaning on the crotch, to improve its resonance (you can also enclose it with your legs, to prevent it from falling forward). 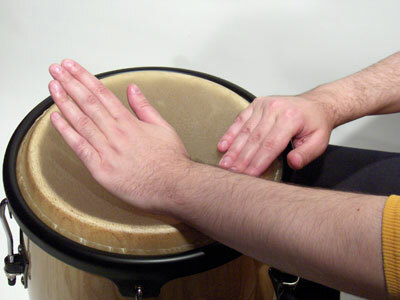 One hand makes the strokes with arm movement and passages (A, A ', E), generally the right (implies a position of the low conga to the right of the right leg) and the other is "stuck" on the central conga filling the rests by a continuous flow of alternating soft strokes, palm and fingers (b and c). 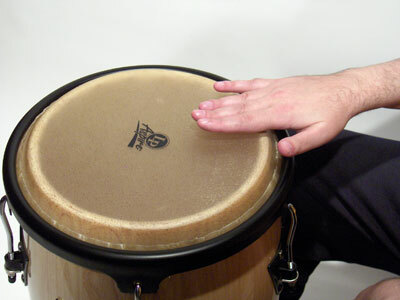 Note that when the palm is rested, it usually precedes a slap to "dry"	it (stroke A'), and when it is lifted, a minimal contact with the fingertips (or even just the middle finger) allows the resonance of the drum (stroke A ). BCbcBCbc... Other binary rolls: bcAAbcAA, bcAAbcEE, AAaaAAaa, EEaaEEaa, BCbcEEbcBCaa, etc. bcA'cbcAA. Other ways to do it: bcA'cbcEE, with single stroke roll and acents (Congolese style): DdA'dDdAa. bcA'cAAbEEbAA or bcA'cAAbcEcAA, on the basis of the ternary clave ("Nanigo"): bcA'cAAbEbEbA, another way to play it: AbA'cAAbA'cA'cA. with full filling (one hand roll): bcbA'cbcbcAbA, montuno version : b-cA'-cb-cA-Ab-cb-EE-bA-A. EbcEbcAb, A'cbEbcAb, DdDaDdEd, dDdEdDaD, ternary: A'cEbAb, DdEdAd, a-Ea'E- . bcBCbcEEa- -a- -EE, imitating clave: bcA'cA'cEEa- -a- -EE, variations: bA'cA'cbEEa- -aa -EE, bA'cbA'cEEa- -a- -EE, filled: bcA'cA'cEbAbcAbcEc, ternary: bcA'cEEa-a-EE, bA'cA'cEa-aaEE. 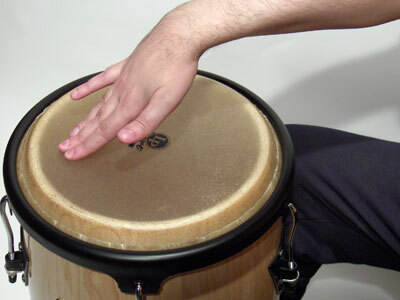 with single stroke roll and accents (African or Peruvian cajon style): EdDa'AdA'dEdA'dAaAa, with palm-fingers technique (Cuban style): b- -A'c-A-b- A'-AaAA. 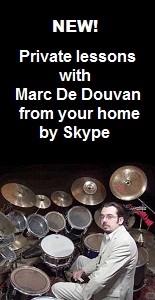 Marc De Douvan, November 2005, translation in English: May 2013.